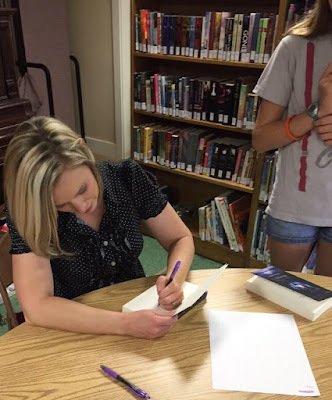 Erin's Rhewsings: Parades, Food Festivals, and Book Signings--OH MY! My love, I can't tell you how much it meant to me to get to be with you on your first book signing! I had such a blast and it was amazing to watch you have fun, interacting with your fans. It was my privilege and honor to get to be part of it. Thanks for the wonderful memories--in Portland, eating, and in the small town parade. I simply adore your tender heart and the poem you signed off with. You held fast to your dreams and now they are coming true. You two are busy, busy... and look happy. <3 I'm excited for you both. That's awesome about your signing, and leads on business that will support local talent! Oh... and drinkable chocolate? Really? You could have offered samples so we could drink and read you blog?